Now, in collaboration with Atelier Pelpell, Kobori has applied their expertise to the development of highly versatile wooden tiles for professional applications. 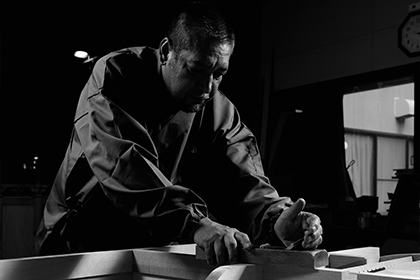 With a design that conveys handcrafted artistry, they enable the creation of premium-quality interiors that evoke the history of Kyoto’s temples. It is an environmentally friendly building material, made with reused antique wood from the elements of Japanese temples. 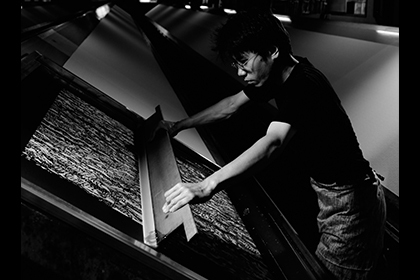 Koseido’s second generation, Yoshishige Tanaka works with the technique called “Hyogu” which is to glue together many layers of washi papers. He applies his extensive experiences in restoring cultural properties such as antique artworks, Buddhist temple paintings and other assets. 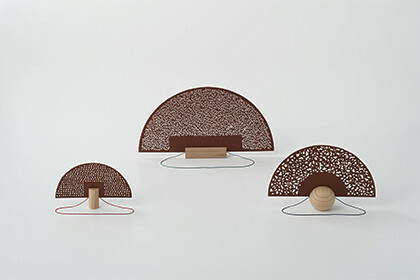 While dedicating his daily efforts to the preservation of a 100 year-old arts and crafts, he also applies his skills to decorative products that suit today’s living environments, rather than persisting in traditions. 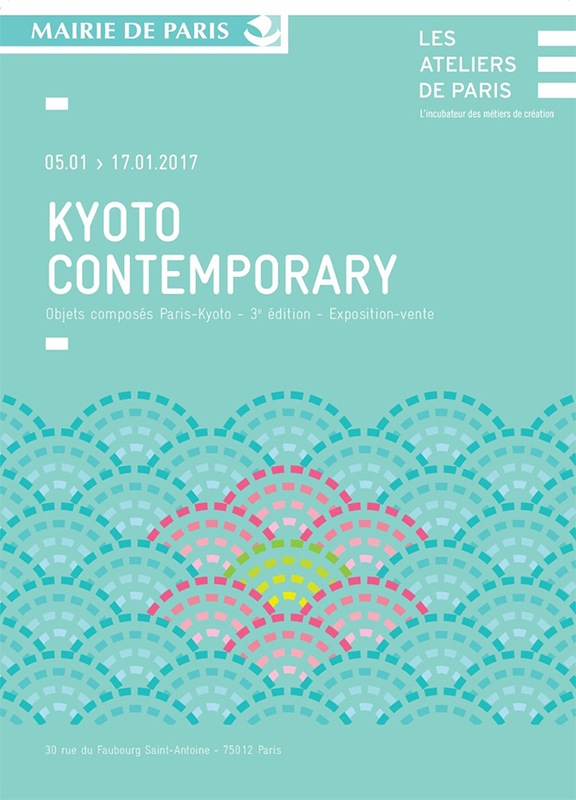 Now, Koseido has teamed up with the designer, Pierre Charrié. 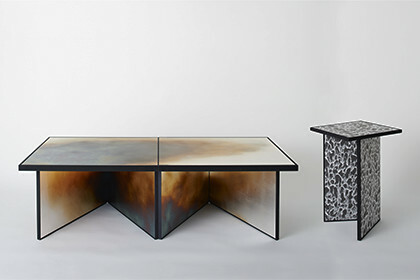 Using washi paper that incorporates the baked silver leaf technique traditionally used in Kyoto Nishijin kimono sashes, they have applied thousand-year-old mounting techniques to create modern folding-screen style tables. 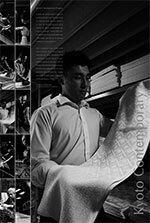 Since 1937, Kyoto Shibori Bikyo has produced and sold kimonos and other fashion products made with “shibori” tie-dye technique. 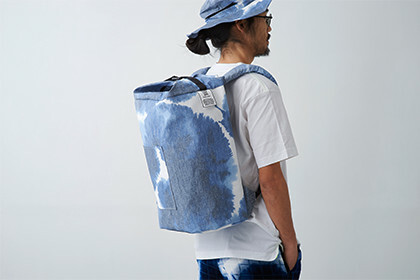 As a traditional craftsman, Kiichi Matsuoka applies time-honored tie-dye methods to materials including not only genuine silk but also leather and more, in the pursuit of innovations in 100% made-in-Japan quality. 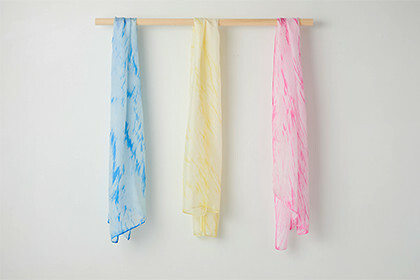 This KIZOMÉ TSU-TSU Scarf Collection “Umi” is a series of scarves made with one of the traditional dyeing techniques of Kyo-Kanoko shibori, in which fabric is wrapped around a cylindrical mold to produce a pattern. 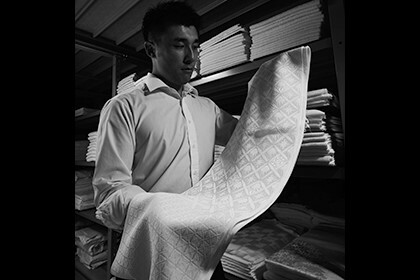 Due to the degree of winding of the fabric, the patterns that appear on the textile become one of the kind. We invite you to enjoy these refined colors and textures. Company : KYOTO SHIBORI BIKYO CO., LTD.
Maruwa carries on the tradition of furoshiki (traditional Japanese wrapping cloth) with a concept in mind; Furoshiki is a tool to represent the sense of hospitality. While taking over the traditional style furoshiki, they try to bring a fresh view point suited for contemporary lifestyles at the same time. 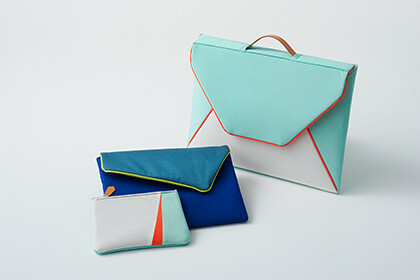 The modern bag featuring a furoshiki with a combination of cutting-edge graphics and a simple and functional leather handle (called TSUNAGU), exhibited last year in collaboration with Unqui Designers, was an enormous success. This year, Maruwa presents the second phase of the project, a series of smaller shoulder bags and backpacks incorporating new furoshiki designs. 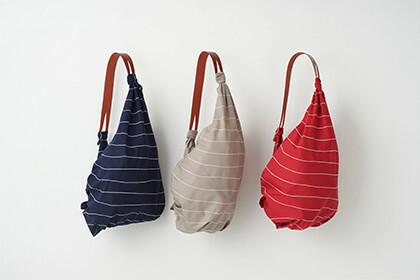 These bags, derived from the furoshiki and full of traditional wisdom, will surely enrich your everyday life. 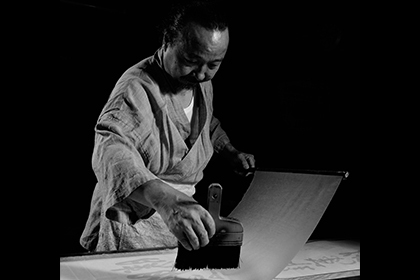 Company : MARUWA CO., LTD.
Takeshi Nishimura has been working for 45 years in the Yuzen-Chokoku tradition - a stencil technique of cutting paper used in Yuzen kimono dyeing. As kimono fashion is becoming less trendy, he decided to preserve this tradition, and started to convey it to a more global audience. 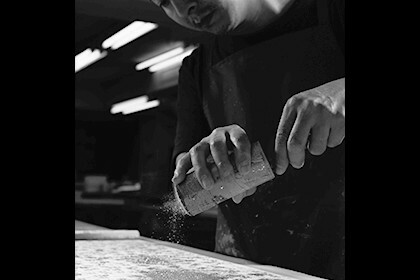 He is passionately committed to expand his expression beyond the tradition to develop everyday goods. 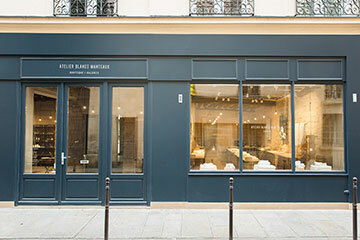 Now, his workmanship and persona has profoundly impressed the designers of Studio Monsieur. 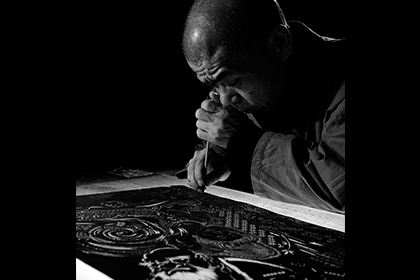 Together, they created the product “Fuu” so as to showcase his work as art that transcends the medium of the stencil. These very special works of Yuzen stencil can be used to decorate a space or picked up and used as a hand-held fan. The items invite you closer to Nishimura’s elegant craftsmanship. 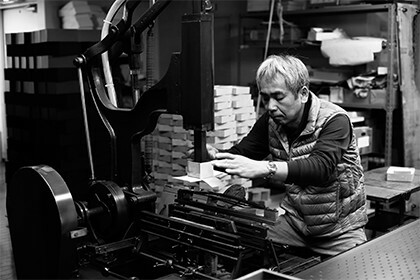 Established in 1923, Tanaka Case manufactures and sells original, made-to-order boxes and cases. They specialize in making cases tailored to customers’ needs, such as gift packages for the products of traditional industry like incense, as well as cases for precision measurement equipment and accessories, jewelry and more. In this collaboration with the designer Sika Viagbo, Tanaka Case adheres to the motto upheld since its foundation; “To make boxes that the users feel willing to keep their most precious belongings in”. Their aim is to create a new style of box that will find widespread acceptance. 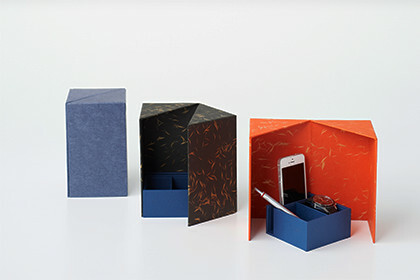 They drew inspirations from its initial product, a watch case, and produced an innovative box that people can use to store smartphones as well as photographs and other small valuable commodities. Company : TANAKA CASE CO.,LTD. 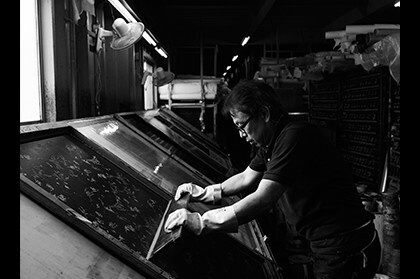 Hisayama Senko Company, located in Kyoto, employs a printing technique called “Tenassen” in which craftsmen print on a textile by hand using stencils. Normally, hand textile dyeing is conducted with glue dissolved in dye. 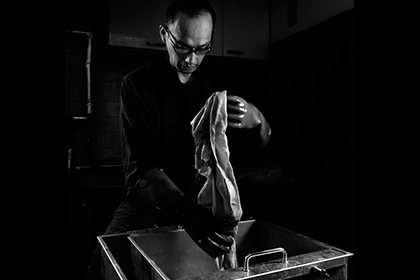 At Hisayama Senko, on the other hand, various chemicals are added to produce innovative fabrics, which they developed independently over a long period of time. In 2016, Hisayama Senko Company launched a new textile brand called Nine Mountain that uses its original fabrics. This backpack, created in collaboration with Céline Thibault, embodies the company’s passion for this new endeavor. A highly practical backpack like this one will grow to be a partner in occasions such as trips, festivals, and outdoor settings. It will share great memories of experiences with the users. Joubu Gama is a ceramic workshop located in Yamashina on the east side of Kyoto. 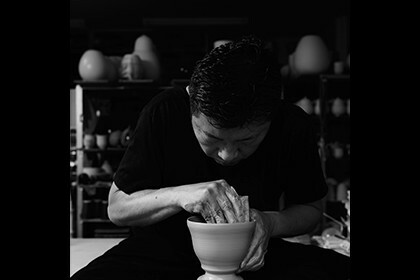 The studio produces each work by hand with loving care, and its richly varied color shades created with their own blended glazes are highly acclaimed both in Japan and overseas. 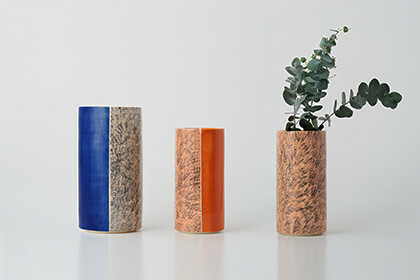 The flower vases created in collaboration with AC/AL Studio is a true work of art, like a canvas that fully showcases Joubu Gama’s great point of pride: colors. The reversible feature of the vase allows the flowers to be presented in multiple ways and also represents the ceramist’s know-how on various types of finishes. The color scheme, rigorously selected by designers from among more than 100 glazes newly developed, is ideal for giving glamorous color accents to modern interior spaces. Urai Co., Ltd. marked its 65th year in business, having constantly supported the kimono stores nationwide and upheld the motto of “creating and conveying the culture of beauty and fashion” through kimono. 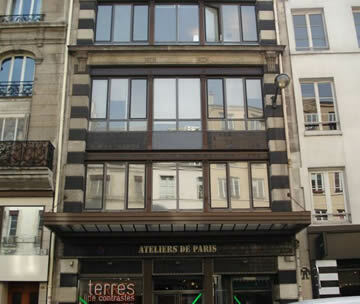 Over the years, the company has adapted to dramatic changes in lifestyles and values. They now make an attempt to create a new brand of tableware and interior goods, called “kiseki”, by utilizing the traditional technique of “Kinsai” craft. 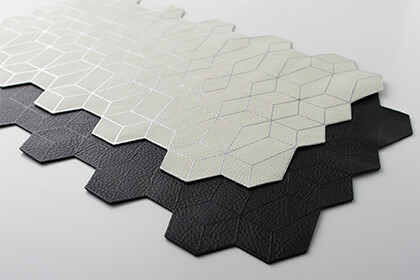 These new style tablemats, incorporating leather materials and Kyo Yuzen dyeing technique, were co-created by Christophe Lhote, designer, and Masao Wada, craftsman from Koei Kogei, one of the most well-known gold leafing textile workshop in Kyoto. 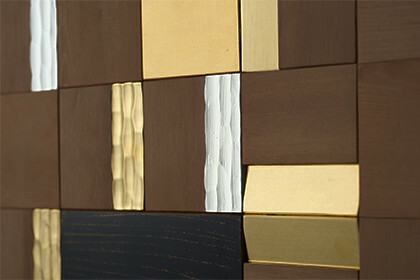 Sparkling gold and Yuzen dyeing are blended to highlight stylish contemporary indoor spaces. Rokkaku, created through a collaboration with Sophie Poupaert, is a series of modern fabric products made with Kyoto’s traditional weaving and dyeing techniques. Kimono fabrics are re-interpreted through the eyes of a young Parisian designer. 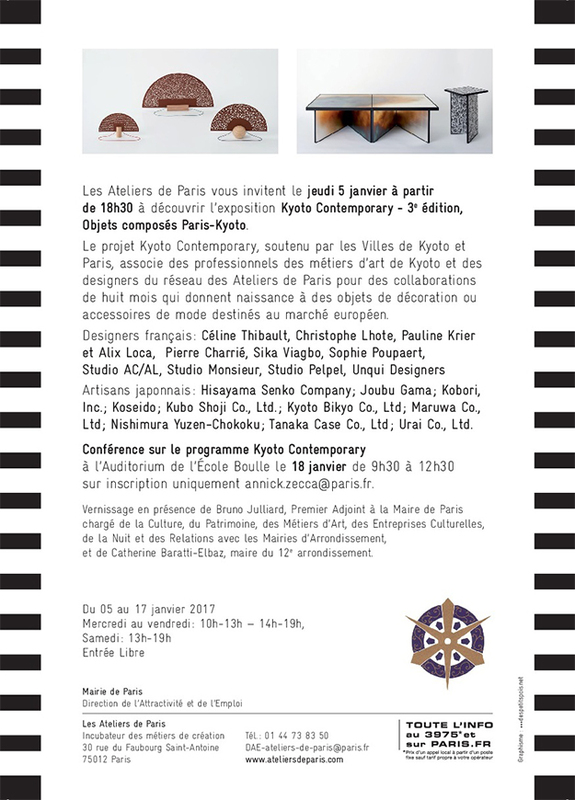 This series of beautiful and outstandingly functional purses fuses the espirit of Paris and the aesthetics of Kyoto.